The first houses of a massive development are hitting the open market and the project’s developers hope the growth eventually shifts the orbit of rail transit in southern San Joaquin County. But the ambitious idea could end up running off the tracks before it gathers significant steam. According to Susan Dell’Osso, Project Director of the company that master planned the massive River Islands development, 41 families have already moved into houses in the 11,000-home subdivision on the western edge of Lathrop north and west of Interstate 5. Lathrops massive River Islands development would like to see ACE Rail extended to their area. By build-out, Dell’Osso expects that 30,000 people and a commercial park to rival Pleasanton’s Hacienda Business Center will call the project’s 4,905 acres on the bank of the San Joaquin River home. But well before that, she hopes the development her family has worked on for 25 years will be an integral part of the regional public transportation system. In addition to the bus routes envisioned for River Islands, a transit station planned for the business park/town center imagines accommodating a re-routed Altamont Corridor Express (ACE) rail service which currently runs four daily trains from Stockton to San Jose and back, stopping at Manteca-Lathrop, Tracy, Livermore, Pleasanton, Fremont, and Santa Clara in between. Dell’Osso said she and her development team “totally support” moving the Lathrop-Manteca station on Yosemite Avenue between the two towns to River Islands. Such a plan could also enhance the railway’s South Tracy station for one in that city’s downtown. “The transit hub has always been in our plans,” Dell’Osso said. San Joaquin Regional Rail Commission Manager of Regional Initiatives Dan Leavitt confirmed re-routing ACE is part of a California Environmental Quality Act review currently under way. The study is part of a larger regional plan for the rail system spurred by the high-speed rail bond passed by California voters in 2008. “It’s an option, and we’re going to fully investigate it at the project level,” Leavitt said of realignment. Dell’Osso said not only would such a switch help the River Islands business center reach its hoped-for potential of 18,000 jobs, it would be a boon for residents employed on the western side of the Altamont Pass. “We’re hoping it’ll work having people commuting (to the business center) and people commuting out,” she said. Leavitt agreed in general that downtown stations and the infill projects that often come with them can encourage growth “that’s more sustainable.” But he also said that the most important near-term goals for ACE are improving existing rail infrastructure and increasing the number of daily trains — from four to six in the next five years and eventually to ten trains in the next ten years. A new alignment through River Islands is not the rail network’s top priority, given needs and trends identified by ACE management. And there’s a related objective that also takes precedence over a new south-county alignment— extending ACE service to Modesto and Merced by 2022, an expansion that would connect the local rail system to the first California High-Speed Rail leg slated for the southern Central Valley. Leavitt said the money for more trains and connecting with HSR will come not only from ridership fares, but state revenue earmarked for sustainable growth and transit projects. However, as of yet there is no funding for a local route change, according to Karlha Davies, SJRRC manager of community engagement and marketing. New rails wouldn’t need to be built — Union Pacific, which owns the rails ACE uses now, also owns rail lines that branch through River Islands and Tracy, according to Davies. But the expenses of renovating those lines, as well as building improvements to crossings and other facilities along any new route, would be significant. ACE’s near-term focus is sensible given that reality, as well as forward-thinking. But there are distinct benefits to a more radical plan that would include making local downtowns the center of transit activity. 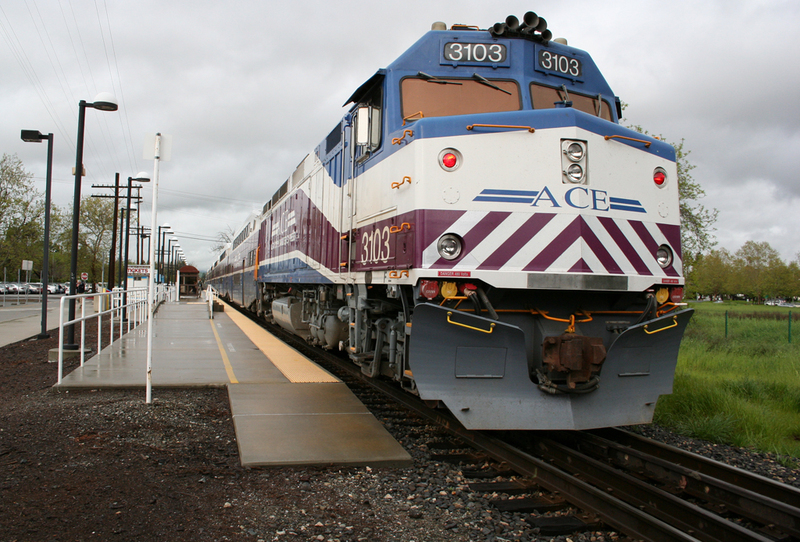 ACE currently runs four round trip trains from Downtown Stockton to San Jose, though future plans call for expansion to ten round trips per day in ten years time. Moving the ACE station from the east of I-5 to the freeway’s west might make sense for Lathrop. Though the change could lead to the impression that the city’s newer west side is being favored over the old east side, River Islands would more than double Lathrop’s population of about 20,000, effectively shifting the city’s center of gravity. And it’s possible that, as part of a connection to Merced, Manteca’s downtown transit station could serve as that city’s ACE destination. Tracy, it should be noted, also boasts an underutilized on-the-rails transit building. Stops in downtown Manteca, Downtown Tracy, and River Islands would help those communities build a sense of place and connectedness by creating central hubs for public transit. It could also draw economic attention and growth to the centers, rather than peripheries, of those towns. Both are concepts with which Central Valley cities have struggled in the past. Such an ambitious vision might be a long haul for ACE. But popular support can go a long way toward shortening the distance between dream and reality. Residents will have a chance to add their weight to the future plans for ACE when the rail commission releases a full report in the next 12 to 18 months. Here’s hoping our neighbors recognize and support the benefits of bringing rail transit to the center of San Joaquin County cities when the draft goes public. Jon was born and raised in Stockton. He returned to the city following four years of college at Loyola Marymount University, in Los Angeles. He is an award-winning columnist and the former editor of the Tracy Press newspaper in Tracy. He currently is associate director of Central Valley Low Income Housing Crop., which assists homeless families and individuals. He lives in Stockton's Miracle Mile district. It sounds like a long wait for the ACE station/track alteration due to current ACE immediate priorities. Eventually, the change will come with the continued growth and population influx. The part here that I just don’t quite grasp is if the people responsible for the River Islands development wish to have direct access to ACE Rail services, and assuming the residents of the community feel likewise, why doesn’t the River Islands development team come up with some sort of financing mechanism to raise the required $170 million (or, at least, a goodly proportion of that) needed for expansion, particularly if the rail service will benefit community residents and businesses there, which, I am to assume, it would. Direct ACE Rail access would seem to have even more value given that one of the more immediate priorities is to connect with HSR. For my money, this is indeed very forward-thinking. To want to include ACE Rail into River Islands’ development plans, well, that’s laudable. Contrast this with the proposed 7,500-acre, 2,500 home/commercial development of Quay Valley. its intended location planned for southern Kings County along the I-5 corridor and presumably accessed by automobiles only. I can only imagine the impact that will have on I-5 in that area. River Islands deserves considerable props for having the insightfulness, moxie for wanting ACE-Rail-service access. Oh, and by the way, a local passenger rail component could do much and go far to create enhanced connectivity in the region, it as well serving as a feeder to future high-speed rail. Not just this, but air quality would surely benefit as a result. Where's the best location for a CSU Stockton? Stockton's draft General Plan neighborhood map: A return to business as usual?